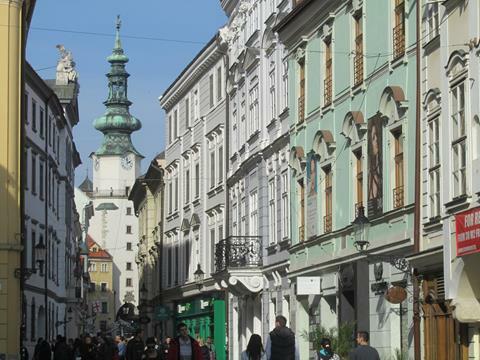 Although just across the erstwhile Iron Curtain from Vienna, Slovakia's capital city Bratislava is quite	a world apart. The peaceful medieval old town, with winding streets and chocolate-box houses,	feels very different from the imperial grandeur of Austria. 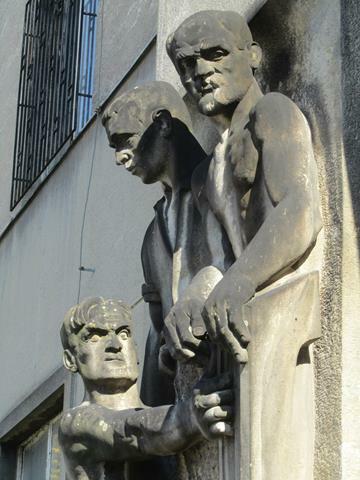 Slovakia split from the Czech Republic	in 1992 in the wake of the collapse of the Soviet Union, and joined the European Union in 2004 along with many other members of the Eastern Bloc. As the Pet Shop Boys said, Go West! 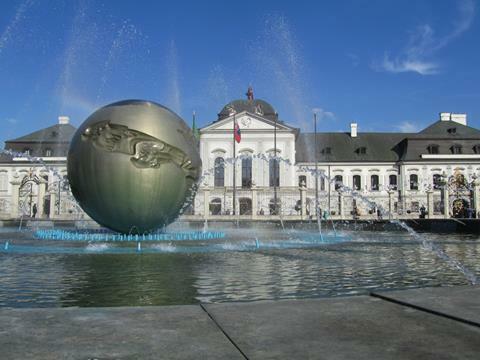 I visited Bratislava for two nights in October 2013, staying at the Park Inn Danube Hotel, after time spent in Italy and Austria. It was just starting to get chilly in the evenings, but by day the capital	was bathed in warm sunshine, and there was nary a stag party to be seen. I travelled in and out	by train from Vienna, which only took an hour each way, and had a great time exploring this beautiful	city. Welcome to Slovakia! Arriving at Bratislava Hlavna Stanica, the central railway station and point of	arrival for travellers from Vienna. A short walk from the station took me to the top of the old town, where I entered through the clock	tower Michael's Gate, on what was once the city walls. I received a further warm welcome from Sch�ner N�ci, who politely doffs his top hat to all and sundry. 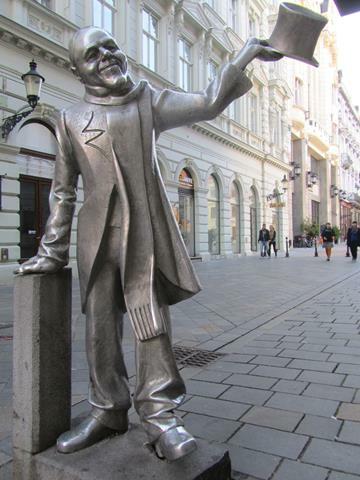 The statue, like a number throughout Bratislava, is based on a real character that used to inhabit	the city. 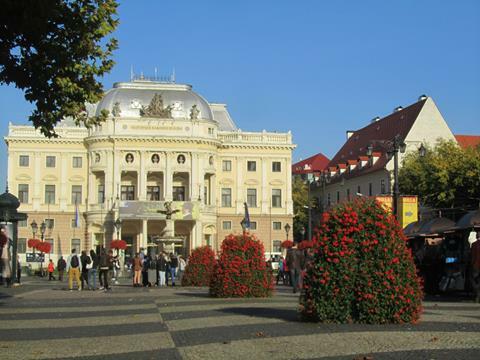 The Slovak National Theatre is on Hvievdoslavovo Namestie, the uncompromisingly long-named pedestrian	boulevard through old Bratislava. 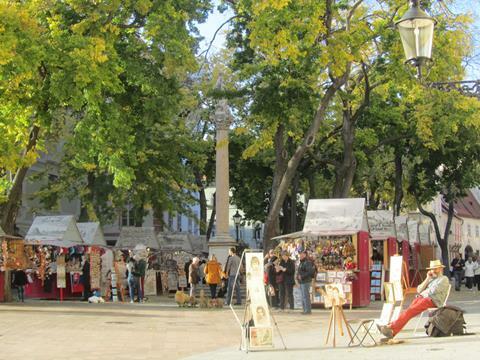 Autumn market stalls just off the central square, Hlavne Namestie. 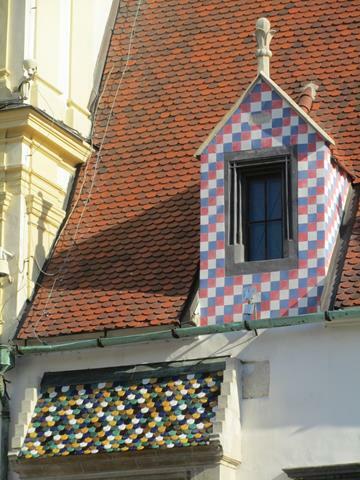 Colourful window of the Old Town Hall on Hlavne Namestie. I unashamedly pinched the idea for this shot	from one of the local tourist brochures. St Martin's Cathedral in the crisp, cool autumn sunlight. 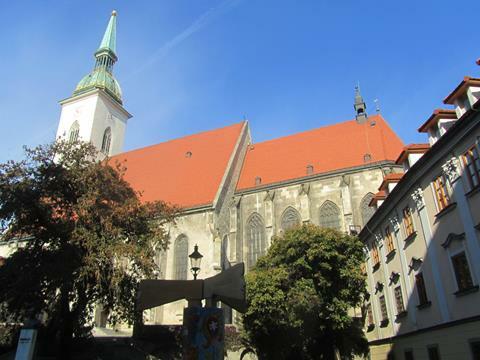 It is one of the oldest churches in the country,	and used to be where the Hungarian kings were crowned. Hvievdoslavovo Namestie is the central pedestrianised boulevard, running from the National Theatre down	to the Novy Most bridge. 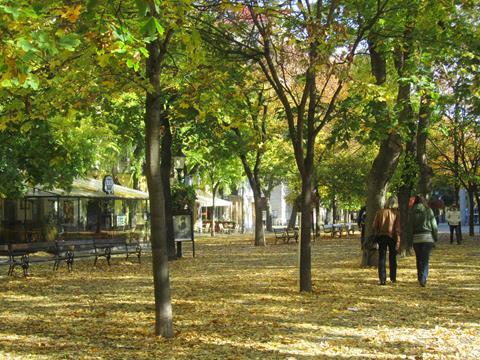 It is lined with pavement cafes and restaurants, and was very pleasant	in the autumn colours. 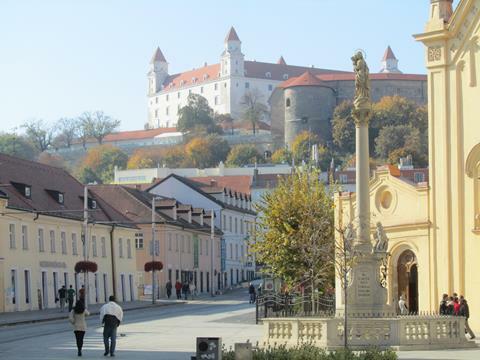 Bratislava Castle stands proudly above the old town, and looks the business since its recent restoration	and having been painted sparkling white. 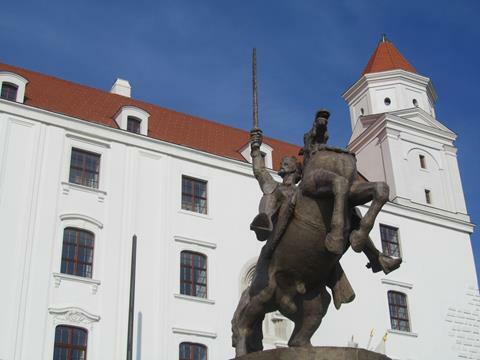 King Svatopluk rides his equestrian statue outside the gates of Bratislava Castle. He ruled during the	late 860s - not a typo, that's over a millennium ago. 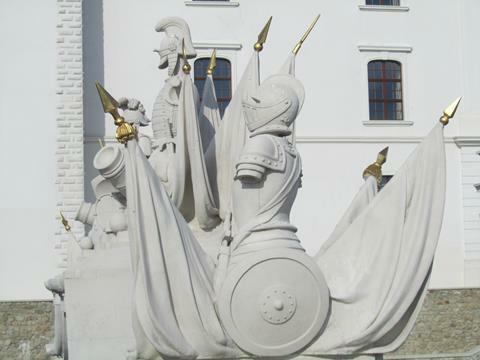 Gleaming white knight statues and gilded stonework on the ramparts of Bratislava Castle. 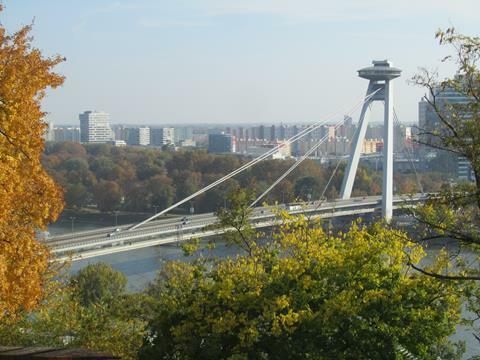 There are expansive views across Bratislava from the castle, including those of more recent times. The column on the central left is the Slavin war memorial, commemorating those who fell during the liberation	in 1945. On the hilltop stands Kamzik TV Tower, featuring that most indispensible luxury	of ex-Communist countries, a revolving restaurant. The UFO bridge, Novy Most crosses the Danube to the south of the old town, and is crowned with a conspicuous,	but non-revolving, UFO shaped cafe. 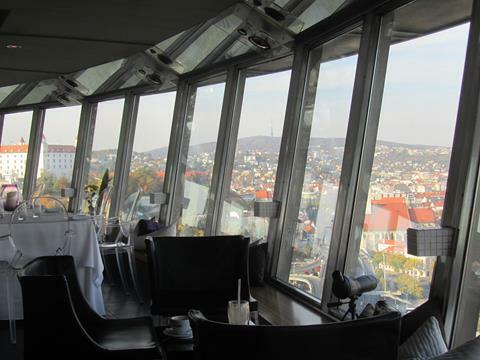 Great views across Bratislava again from the really quite good UFO cafe. 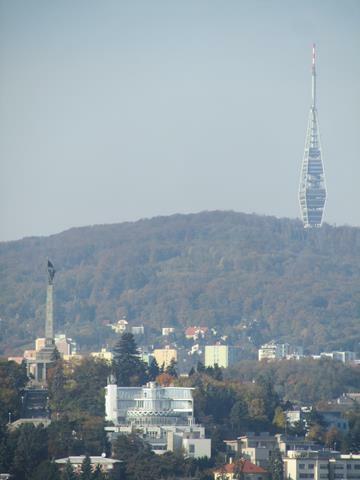 The castle can be seen on	the left, and Kamzik TV Tower on the hilltop in the distance. The mighty river Danube, Europe's longest river, runs through four European capitals on its way to the	Black Sea. 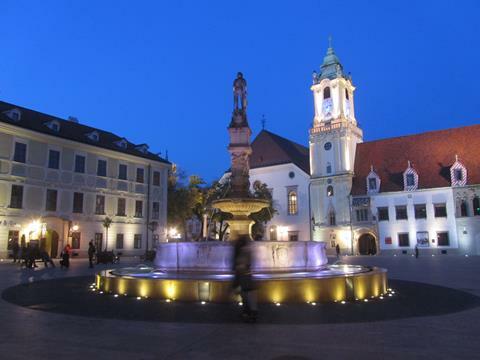 Having already passed through Vienna and Bratislava, the next stop is Budapest, followed	by Belgrade. 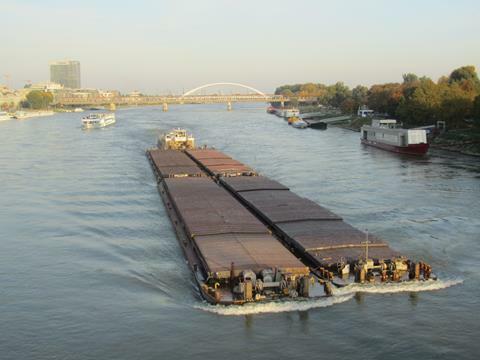 Watching giant barges power their way upstream against the current was very impressive. The Danube was crossed by the old railway bridge Stary Most, seen here just a few months before its	demolition. 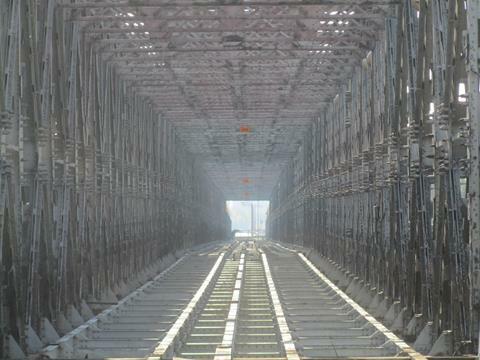 It will be replaced with a new bridge for foot traffic, cyclists and trams. 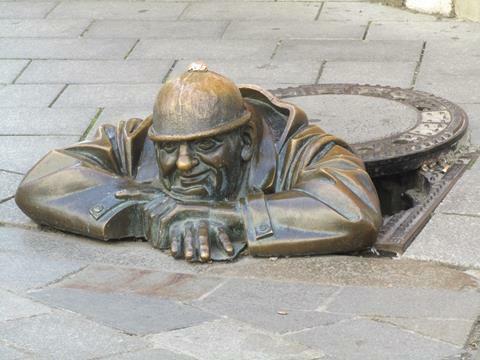 Another of old Bratislava's characters, Cumil or Rubberneck, lurks in a manhole in the centre of town. Whether he is having a rest after cleaning the sewers, or is skulking low down for more nefarious	purposes, is up for debate. 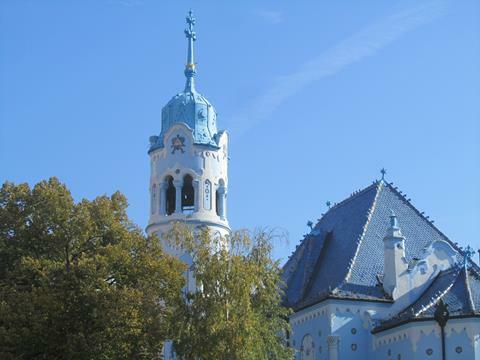 The Blue Church looking very pretty against the sky. I tried a dozen times to get this photo framed	and focused as I wanted, but eventually realised that it was probably time to get a new camera. Across from the Blue Church was a large abandoned building, an institution of some sort perhaps, complete	with Soviet style statues carved into the walls. Despite trying, I've been unable to find out	anything about it. Hlavn� n�mestie is what I gathered to be the main square, I sat in a little cafe and drank a beer while	the sun went down. 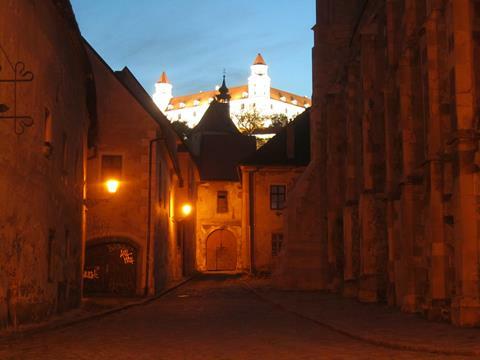 By night, Bratislava Castle gleams in floodlights above the dim streets of the medieval old town. 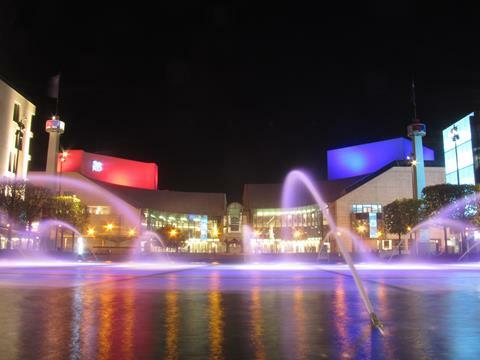 East of town is the starkly modern Eurovea centre, a giant shopping, dining and entertainment complex	for the bold new EU-member Slovakia. 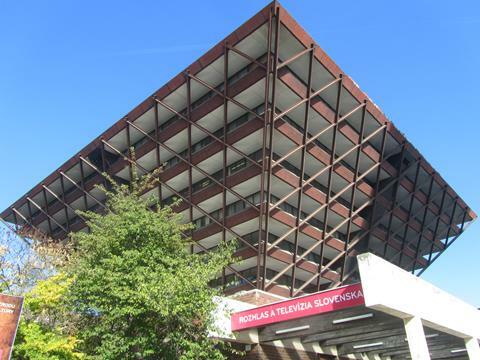 The inverted pyramid of the Slovak Radio building really interested me, as I thought of Orwell's pyramidal	Ministry of Truth disseminating broadcast propaganda in 1984. Here it is quite literally turned	on its head. Grassalkovich Palace, the residence of the President of Slovakia, is not far outside of the old town	on the way back to the station. Presidents Bush and Putin met here in 2005. 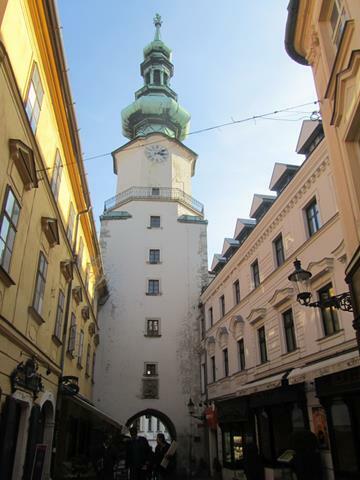 A final shot of Michael's Gate, surrounded by toy-town style colourful houses in beautiful medieval Bratislava.